Support hormone levels throughout the month with Starflower Oil, a high strength capsule filled with the essential omega 6 fatty acid. Our Starflower Oil is extracted from borage seeds, which boasts the highest level of naturally-occurring GLA in any plant, a compound which converts to a useful hormone-like substance in the body. 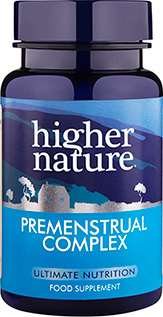 With 220mg of high-quality omega 6 per capsule, our high quality Starflower Oil helps maintain healthy hormone balance throughout the month, and particularly around menstruation. 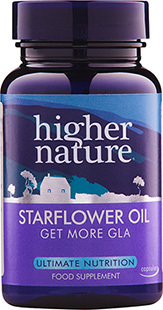 1000mg Starflower Oil (cold pressed) providing 220mg of Omega 6 GLA. 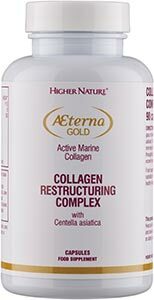 I have seen very promising results with this product. It cleared up a facial dermatitis that I had within 3 weeks and my hormonal acne is now manageable. I take between 2-3 capsules daily. 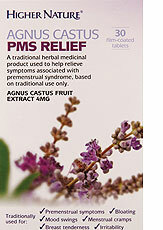 While some women sail through the menopause relatively symptom free, others endure a whole raft of physical and emotional symptoms, which may include hot flushes, night sweats, mood swings, vaginal dryness, insomnia, weight gain, low libido, lack of energy, irritability, dry skin and headaches. If you are suffering menopausal symptoms, what can you do to maintain your well-being and ease yourself through this mid-life transition? Q: My colleagues might be wrapping up warm but I suffer terribly with hot flushes and am forever taking layers off. What do you recommend?